After my post about Sanel and Tariq winning the Tokyo Guitar Competition I got an email from Tatjana Lazovic, who is the proud mother of Ema Kapor, the talented guitarist I wrote about earlier. I want to inform you that they both like their dear guitars very much and play very nice on them. Belmin and Ema had many successes playing the guitar this year, and the last one is winning the Guitar Fest in Banja Luka (Bosnia and Hercegovina) this November. Ema won 1. 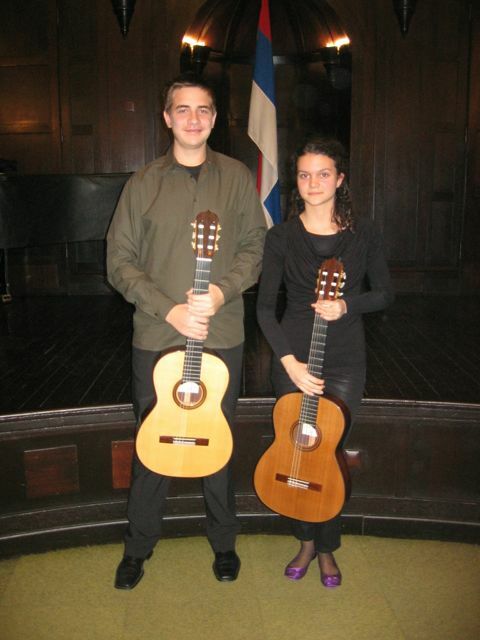 Prize in IV category, playing Recuerdos de la Alhambra (F.Tarrega) and Usher waltz (N.Koshkin). Belmin won 1. Prize in V category, playing Capriccio No.15 (L.Legnani), Suite BWV 998, Prelude (J.S.Bach) and Mallorca (I.Albeniz). After the concert of the winners, I took this photo. Congratulations Belmin and Ema ! !